On February 4 and 5, 2012 Alexander Schmorell will be recognized (canonized) as a martyr saint. After the beheading on July 13, 1943 Schmorell’s body was buried behind Stadelheim Prison in the cemetery at Perlacher Forst. 50 years later, in 1993, Schmorell’s parish buys and reconstructs a church-building across the street from where his earthly remains are buried. In the iconostasis of the church dedicated to the New Martyrs of Russia, there is an icon showing Schmorell among the saints canonized by the Russian Church Abroad since 1964. In less than a year, all the principal participants in the group plus many collaborators had been identified, arrested and executed, but their memory lives on. 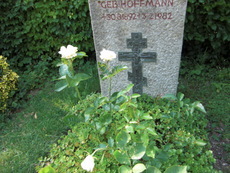 Today not only has the White Rose become important to Germans, but it is internationally known. This is in part thanks to “Sophie Scholl: The Final Days,” the Oscar-nominated film that focuses on the youngest member of the White Rose, Sophie (only 21 when she died) and her brother Hans. There have also been several books, including Sophie Scholl and the White Rose, and numerous web sites. In January 1943, the fifth leaflet was ready. Asking if Germany was forever to be “a nation which is hated and rejected by all mankind,” the text called on its readers to dissociate themselves “from National Socialist gangsterism” and to “prove by your deeds that you think otherwise…. Cast off the cloak of indifference you have wrapped around you. Make the decision before it is too late…. Separate yourselves in time from everything connected with National Socialism. In the aftermath a terrible but just judgment will be meted out to those who stayed in hiding, who were cowardly and hesitant.” Thousands of copies were distributed all over “greater” Germany – that is, in Austria as well. Schmorell’s travels brought him to Linz, Vienna, and Salzburg. Archbishop Mark of Berlin, head the German diocese of the Russian Orthodox Church Outside Russia, says that in the near future Schmorell will be formally recognized as a martyr saint. In 2007, he led a pilgrimage group to Orenburg, Russia, to celebrate the 90th anniversary of Schmorell’s birth, an event arranged by Igor Chramow of the Eurasia Foundation in Orenburg. During this trip, the pilgrim group met 87-year-old Nikolai Daniilovich Hamazaspian, who, while living in Munich, had been a friend of Schmorell. He had given Schmorell his Bulgarian passport for possible flight from the country. Hamazaspian recalled that Schmorell had often spoken with him about spiritual matters, since they were both Orthodox Christians. Published in the Winter 2011 issue of In Communion, the quarterly journal of the Orthodox Peace Fellowship.